Tens of thousands of happy clients! Nobody can afford to lose data, especially if you run a business. Clients worldwide have been relying upon JaguarPC for over 10 years to maintain their data. We are pleased to offer our Data LockBox service powered by Idera Enterprise Continuous Data Protection. How it works is simple but powerful. See why JaguarPC offers the best web hosting services. 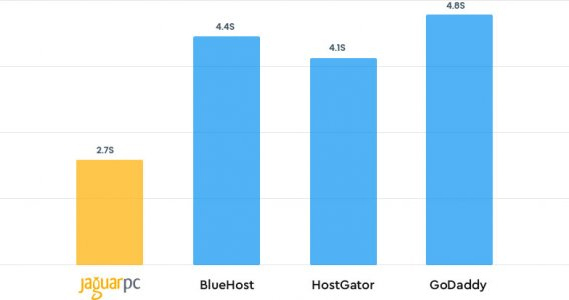 For 20 years JaguarPC has consistently been ranked among the worlds top hosting providers. Decades of awards and 97% client satisfaction rating prove we know how to deliver successful business websites. There are so many benefits to hosting through JaguarPC. I've been in JaguarPC since 2005. Best service. Jaguar is AWESOME! I'm almost afraid to say how awesome they are because they're so great it gives me an edge over my competition... rrrr, but I do want them to succeed as much as possible. Such a dilemma. We've been a client of Jaguar PC since 2005 and will remain so for some time yet. They are a brilliant hosting company and their support team are fantastic. Brilliant hosting and fantastic support. We've been a client of theirs for the last 14 years and are always pleased with the service and support. Excellent support and services, and I like the variety of plans they offer which are reasonable in price. Overall a pleasant hosting experience, well worth checking out. My strategic ally for more then 15 years (with all merged ancestor companies)! Tech and sales are great guys! Carol in billing was wonderful. actually, i've always gotten good service but Carol was "proactively wonderful" .... she helped me in a way that i hadn't even asked for (after asking of course). Thank you to Bilal B and the other Support Representatives for always having my back when things go wrong, especially when it's my fault. I didn't even panic when I mindlessly deleted an entire website while cleaning up FTP logins because I knew they could "seemingly easily" restore it from backup. I've been a continuously happy client for 15 years.Thanks for the great service! I've used JaguarPC for over 10 years. Most vendors forget you after you are signed up. JaguarPC has upgraded our accounts to newer, faster hardware, several times over the years. I seriously have never had a memorable issue with speed or bandwidth. When I have had issues with my configurations or adding sub domains, the service tech respond rapidly. They are polite and very knowledgeable, and again, they have been that way for over a decade. I know it sounds like a shill, but this is an honest post. After more than 10 years, I am STILL amazed by JaguarPC. Great value for money, solutions available for all needs, support always available and responsive; you feel like they work for you directly and you're the boss, great attention and polite while providing timely solutions. Its been now over 10 years... Well done keep it up!!! Incredible client support. And fast. Their security help saved me a ton of time & heartbreak so THANKS!!! Amazing hosting and excellent service are always available at JaguarPC! Signup today and if you aren't fully satisfied with our shared, reseller, or VPS hosting will will gladly refund you for those services.